BLYNK app will send message to your NodeMCU over Wifi, these signals will be translated by NodeMCU and LED strip will change color as received in the message. D5 pin is connected to TIP 120 NPN(U1) transistor's Base pin. D6 pin to Base pin of U2. D7 pin to Base pin of U3. U1, U2 and U3's Emitter pins are grounded. Grounded, That's sad! 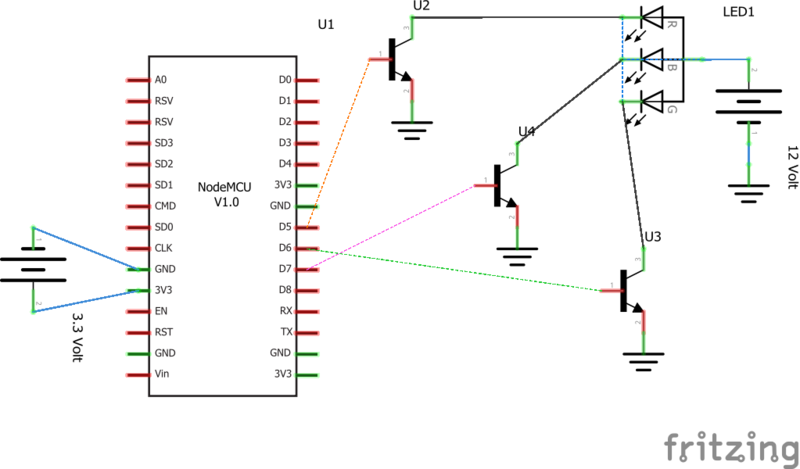 NodeMCU is connected to 3.3 Volt power supply. LED strip's power PIN is connected to 12V supply. Now, we are done with the circuit of our Mood Light! Write Project Name and Select ESP8266 or NodeMCU from dropdown. 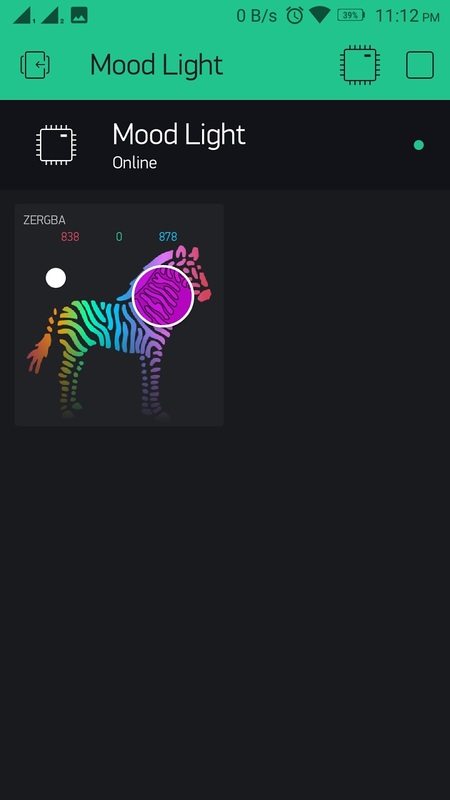 Tap on the screen and add a ZERGBA WIDGET on screen. Tap on the Widget and select Digital PIN 5 for RED, D6 for GREEN and D7 for GREEN, rest unchanged. Note: This will change colors only over WIFI not over internet. Color changing LED strip as almost ready, just a few steps to go. Working with BLYNK is so simple that we only need to add our AUTH ID(noted above), Wifi SSID and Password in the code and upload it to NodeMCU using Arduino IDE. In the code, we do not need to setup our pins this is already done by BLYNK in their library. If you do not have BLYNKEsp8266 library, download the BLYNKEsp library from Sketch menu --> Include Library -->Manage Libraries. Search for the BLYNK and install it. Upload the code to your NodeMCU or ESP8266 and device will be displayed online on your BLYNK app. 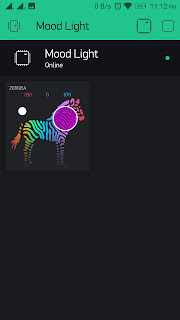 Click Play button on top right of your app and start changing colors of your light. Your precious comments and suggestions are always welcome, feel free.